If you are looking for a thrilling outdoor fun in Branson, try an off road adventure at the Shepherd of the Hills ATV Adventures for a unique way of experiencing heart-pumping road adventure. These off road excursions take you out for one of the best tours of the entire Branson area. 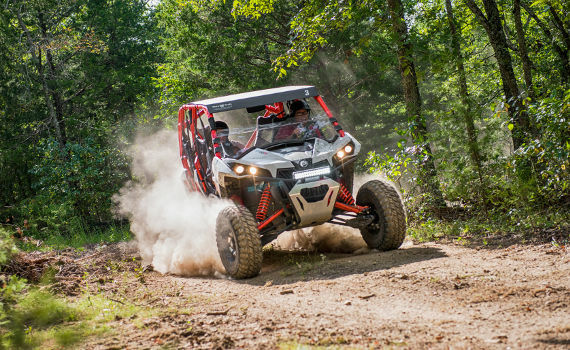 These beastly ATVs provide plenty of power which makes it easy to conquer off-road terrain. Whether you opt for the one hour or 90-minute adventure tour, you are bound to have an amazing time exploring the area. This 177-acre property at the Shepherd of the Hills is now home to ATV trails where guests can have the opportunity to ride over the bumpy terrain of the Ozark mountains. This property is part of the homestead’s mission to help families enjoy great outdoor fun in Branson. When you embark upon a thrilling journey on an Off Road ATV Adventures, you can have the opportunity to see some of the best parts of the Ozarks. There are two different off road adventures to choose from. The 1 hour excursion called “get your feet wet types” includes some time for instruction and learning how to operate the ATV/UTV’s on pavement before heading off-road into the Shepherd of the Hills trails for approximately 30 minutes of backwoods adventures. If you think one hour is not enough, you can upgrade to the 1 ½ hour excursion with one hour of deep off-roading that’ll make the hair on the back of your neck fly. All trail adventure rides are guided throughout the property with the assistance of the Shepherd of the Hills staff. Each ATV can hold up to three passengers and a driver. As you start the journey, you’ll follow along after your skilled and knowledgeable guide while you whiz past the lush forests of the Ozarks area. You will see the rolling hills up close and get closer to the beauty of nature. It’s going to be a blast for people of all ages, and the ATVs are even capable of carrying a car seat. So whether you’re 9 years old or 99, you’re bound to have a blast. Before the start of each tour, a short instruction is to be conducted where participants will be taught how to safely operate and handle the off-road vehicle. Helmets are provided to make sure your adventure will be safe. These unique off road adventures are to be the highlight of your vacation in Branson, so don’t miss this opportunity to see the beauty of the Ozarks via this fascinating off road trip. With the Ozarks as your backdrop, be sure the off road adventure you choose meets your needs and get ready for this adrenaline pumping activity. These ATV trails are expected to be one of the most popular of the several new attractions to the historic Shepherd of the Hills Homestead. Shepherd of the Hills ATV Adventures is a great way to experience great outdoor fun in Branson as it offers adrenaline pumping off road adventure.